Frank Frost was born and raised in Arkansas but his experience with the blues started in St. Louis in the early '50's, under the guidance of Sonny Boy Williamson (#2) and Willie Foster. In St. Louis he also met Sam Carr who would become his musical mainstay and friend for life. Together with Big Jack Johnson, they shook the juke joints down. Their 1962 album "Hey Boss Man" is considered a down home blues classic. Frank started on the harp, and in 1951, at age 15, he had his first professional work with Willie Foster. By age 20, he was playing and learning from Sonny Boy Williamson, who once threw Frank's capo out the window during a road trip telling Frank he's gotta learn to play guitar without one. And learn he did, excelling at not only the guitar, but harp, vocals and keyboards as well. Frank was featured in the movie "Crossroads" and recorded for the Sun, Paula, Earwig, Appaloosa, Evidence, Cannonball, HMG, Fat Possum and Big Boss labels. 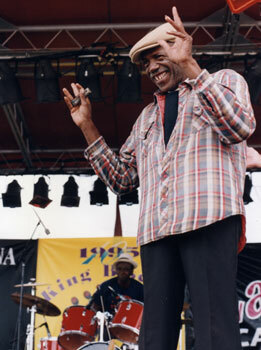 His recordings with Willie Lomax on Big Boss are Frank's last recorded works. Anyone who ever attended the King Biscuit Blues Festival had undoubtedly witnessed Frank and Sam mesmerize the crowd with a brand of down home blues unequalled since. These hometown heroes would hold juke joint jams at Frank's home, Eddie Mae's Cafe (a block from the main stage) each night of the festival, where Frank would hold court with his harp even when his health started to fade. Honeyboy Edwards, Big Bad Smitty, Sam Myers, Arthur Williams...it was a feast of the blues Who's Who paying homage to the King of Down Home Blues, Frank Frost. Frank once said he stayed in Lula, Ms. and Helena, Ark. because in Chicago life was too hard, but at home there was always a fishing hole and life was easy. Frank passed away on October 12, 1999 at the age of 63. A funeral was held at the Malaco Theater where Big Jack Johnson sang and Sam Carr played the drums with his right arm, his left arm craddling his grief-stricken head, muffling his cry and soaking up the tears a few feet away from the casket. Another link in the chain is gone. Another friend has passed away.